Historic spring box constructed over the source in the 1930s. Coyote Springs, located on Museum of Northern Arizona grounds, is one of the last functioning springs in the San Francisco Peaks. As a tributary to the Rio de Flag, itself a tributary to the Little Colorado River, Coyote Springs is a perennial water source with significant restoration potential. 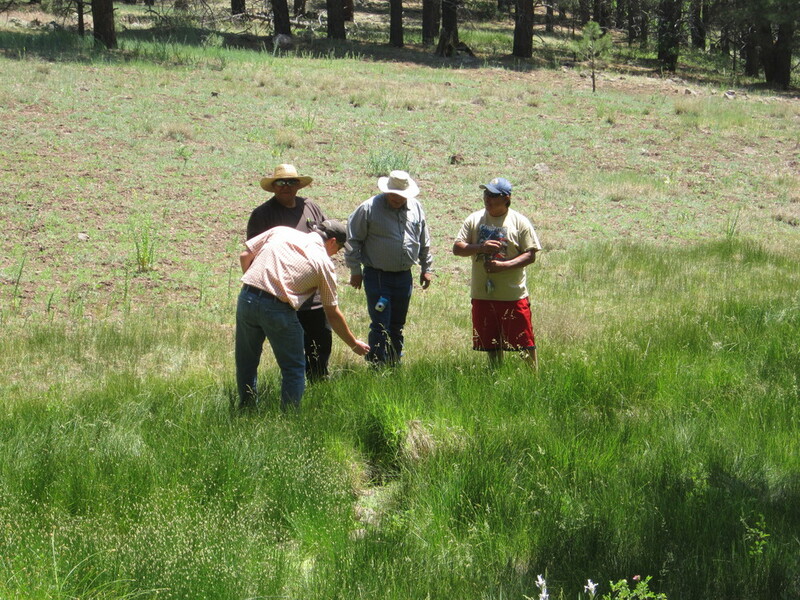 With funding from the Arizona Water Protection Fund Commission and the Coconino County Board of Supervisors, we will rehabilitate this spring to restore its ecological functionality. Flow will be diffused onto the wet meadow to restore ecological functionality of the spring. This will involve removal of an old, non-functional concrete tank that was installed decades ago at one of three sources. During rehabilitation efforts, we will preserve and protect an historic spring box from 1935, located at the primary source. Trained SSI staff, Hopi Tribal youth, and volunteers will demolish the concrete tank manually, or if needed, use heavy machinery. This restoration of natural flow will allow the wet meadow (helocrene) to hold water for longer and re-establish itself as a healthy ecosystem. SSI and participants will also fence the source, which will reduce potential incision of a channel from heavy wildlife visitation. Wildlife will still be able to access water directly downstream. The site restoration will improve about an acre of riparian, stream, and wetland habitat. We are hopeful about downstream benefits to the Rio de Flag as well, and will be quantifying them after the site is restored. Coyote Springs makes a great classroom. A significant outcome of this restoration will be the educational benefits for the community. Over the last 15 years, SSI staff have used Coyote Springs to provide over 250 private, NGO, state, Tribal, and federal agency staff with essential in-the-field training about conceptual approaches, technical methods, and data collection related to springs inventory, assessment, and monitoring. It has been useful in its current, modified state, because many of the springs that researchers assess in the field are similarly altered or degraded. The restoration of Coyote Springs will provide an essential educational site for springs restoration as we collectively move forward into increased springs restoration activities. Coyote Springs will continue to remain an example not just of where we have been, but of where we are going. We will welcoming volunteers and donations to SSI to support this restoration effort. All contributions are tax deductible, and any amount will help. Is the coyote chasing the deer, or vice-versa?